Kapilvastu, formerly Taulihawa (or, Kapilbastu Kapilvastu District), aprox. 30,000 inhabitants, is a Nepali municipaliy in Lumbini Zone (Terai), appox. 250kms west of Kathmandu near the Indian border. The village of Lumbini, 25kms east of Kaplivastu is thought to be the birthplace of Siddhartha Gautama in the sixth centuary B.C. 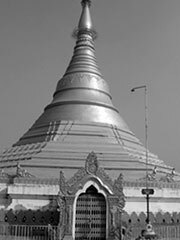 and is a site of pilgrimage for Buddhists from all over the world. (Buddha) is thought to have grown up and lived there to the age of 29. Siddhartha spent his early life in Kapilavastu as a prince, mostly oblivious of worldly miseries. He got married to Yashodhara and had a son named Rahula. Upon confronting worldly miseries such as disease, aging and death, he left Kapilavastu in search of enlightenment and in quest of answers to his questions about such miseries, pain and sufferings. Kapilavastu is considered a holy pilgrimage for buddhists.